Visit one of Europe’s most fantastic cities, full of famous historic monuments. Stroll along the banks of the beautiful River Seine or enjoy the many museums, shops, and cafes! 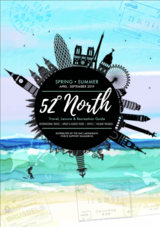 With so much to see and do, Paris really does have something for everyone! We depart in the early hours of the morning and begin our journey to Paris. Time permitting we head straight into the city centre. Choose to explore on your own or begin your Paris experience by joining us for our optional “guided tour by coach & boat” (extra cost). See many of the famous sights and monuments Paris has to offer on the coach, with commentary and photo stops where possible. 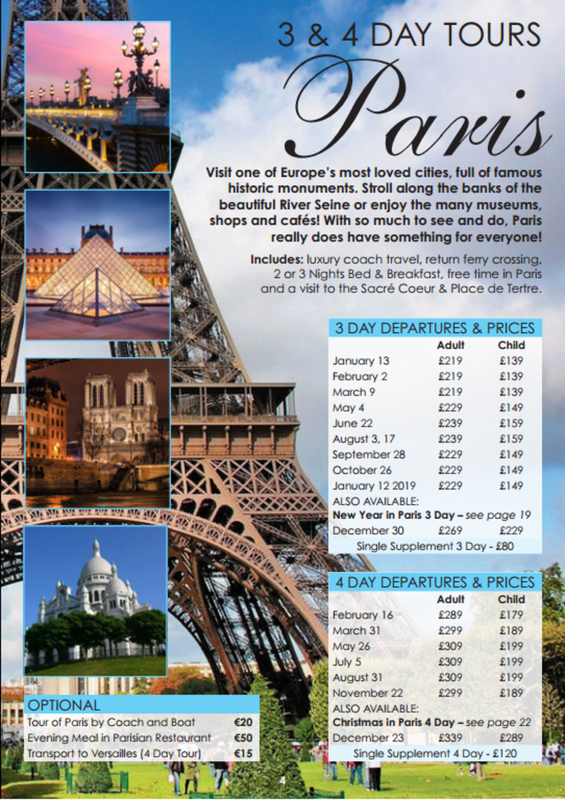 Following the coach tour, you will take an hour-long sightseeing cruise along the River Seine to see the sights from a great alternative angle. We arrive at our hotel late afternoon and after we’ve checked in, the evening is free for you to enjoy one of the restaurants or take aways in the local vicinity or make you may wish to make your way back into Paris centre for some more exploring. After breakfast, you can choose whether to spend a full day exploring Paris or take our optional trip to Versailles (extra cost). Explore this royal château in the Île-de-France region of France which is now open as a museum and is a very popular tourist attraction. We travel back to Paris mid afternoon for a little free time before our optional evening meal (extra cost). We enjoy a meal together in a Parisian restaurant with French cuisine, wine, soft drinks and light entertainment. After breakfast, we board the coach and head into Paris centre. The day is yours to spend as you please. Perhaps you would like to see the famous Mona Lisa in the Louvre or go up the Eiffel Tower; stroll around the Notre Dame Cathedral that dates back to 1163 or enjoy the food, wine and shops that Paris has to offer. With so many options, Paris has something for everyone! We meet up early evening for our optional evening meal (extra cost). We enjoy a meal together in a Parisian restaurant with French cuisine, wine, soft drinks and light entertainment. Following breakfast, we load the coach and make our way to Montmartre to visit the Sacré Coeur & Place de Tertre. We continue our journey to Calais, arriving home late evening with fantastic memories of Paris. Our Tour Managers reserve the right to amend itineraries to enhance your experience of Paris. If circumstances result in us being unable to offer the tour on day 1, it will be offered at an alternative time. Entrance fees incurred during free time are not included. This tour travels on the same coach as our Disneyland Resort Paris Tour. Bring euros for spending money on this tour. 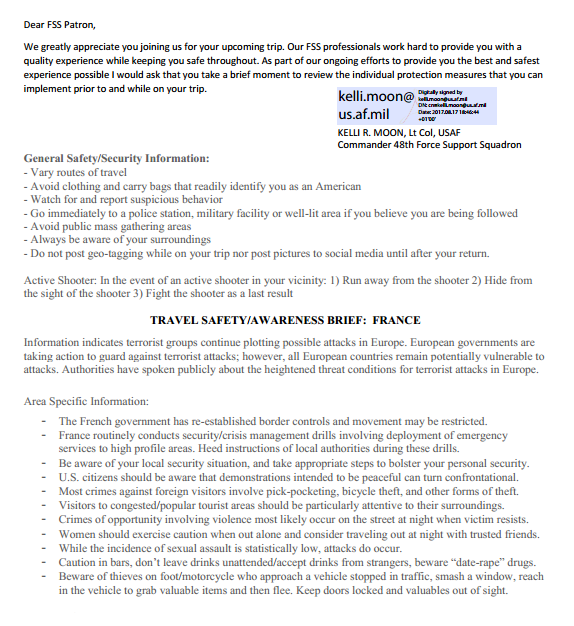 Before you book a trip, you must read, understand, and accept all conditions disclaimers from the ITT Website.